Posted on September 29, 2014 by Kaylie W.
Jill MacSweeney, a seventeen-year-old trying to find her place in the world, desperately wishes for her life to go back to normal. But ever since her father passed away, she can’t help but feel angry at the world and isolate herself from everyone who tries to support her—her boyfriend, her best friends, even her own family. And when her mother chooses to adopt a baby, Jill feels as if she’s trying to replace a lost family member. Can she accept her mother’s decision and embrace this sudden change in her life? Mandy Kalinowski, on the other hand, has experienced firsthand what it feels like to grow up unwanted and be raised by a mother who never actually loved her. So when the nineteen-year-old Mandy becomes pregnant, she vows to provide a better life for her baby and find someone who will love her for who she is. Will Mandy be able to overcome her doubts and fears to find that “perfect” family for her and her unborn child? 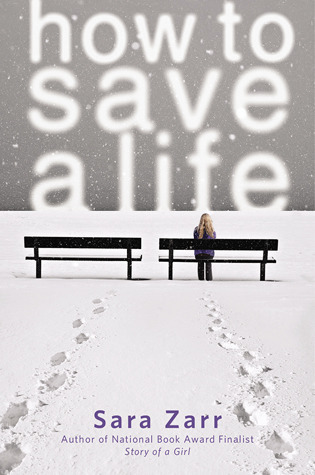 Written by Sara Zarr, How to Save a Life is a novel that teaches readers about the meaning of life and love. Jill and Mandy are two distinct characters who both show signs that they are “lost.” In the end, they unexpectedly realize that they need one another in order to “find” themselves again. Since I normally prefer the sci-fi, dystopian, action/adventure genres, this realistic, heartfelt fiction book was not in my usual range of interests at all. To be honest, I’m not quite sure why I decided to read this book. However, it turned out to be much more than what I expected. I would certainly recommend this novel to anyone over the age of fourteen (due to some explicit language), even if you aren’t a fan of realistic fiction like me! This entry was posted in Book Reviews and tagged contemporary, realistic, sara zarr by Kaylie W.. Bookmark the permalink.